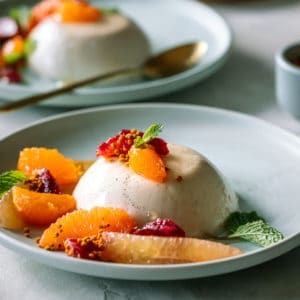 This Coconut Milk Panna Cotta is a luscious dessert that’s made with coconut milk, honey and vanilla beans and paired with a bright citrus compote. It’s gluten free, dairy free and refined sugar free (but definitely not flavor free)! I did a kitchen walk-through for a client that I’ll be cooking for soon. It’s someone very high profile who I’m seriously SO excited to meet, but I’m not allowed to say who because I had to sign a NDA this time. Which is a bummer because I really want to tell you! But my lips are contractually sealed. Anyway, the house is located in a super secluded, SUPER exclusive enclave called Hollister Ranch that’s literally right on the ocean bluffs with roaming cattle, horses and lush green pastures everywhere. This is what I’ll get to stare out at while I’m prepping food and washing dishes and I’m not mad about it. So I did the walk through, that was all fine. But my gas light came on in the car on the way there when I still had a ways to go. And this place is REMOTE, guys. Cell service is spotty at best. After I drove through the property gates I had to drive another 6 miles on this winding private road to reach the house, then 6 miles back to the gate, and it was another 13 or so miles to the nearest gas station. Well, I made it to the gas station, but just barely! And can I say that driving on empty for almost 30 miles is very stressful? MY HEART WAS PUMPING THE ENTIRE WAY YOU GUYS. I do realize in the grand scheme of things how inconsequential this kind of thing is, but running out of gas on the highway is kind of scary. So I was thankful for the close call. Moving on…where do I even begin to sing the praises of this Coconut Milk Panna Cotta? I do appreciate how just looking at it calms any lingering anxiety from today’s harrowing ordeal. 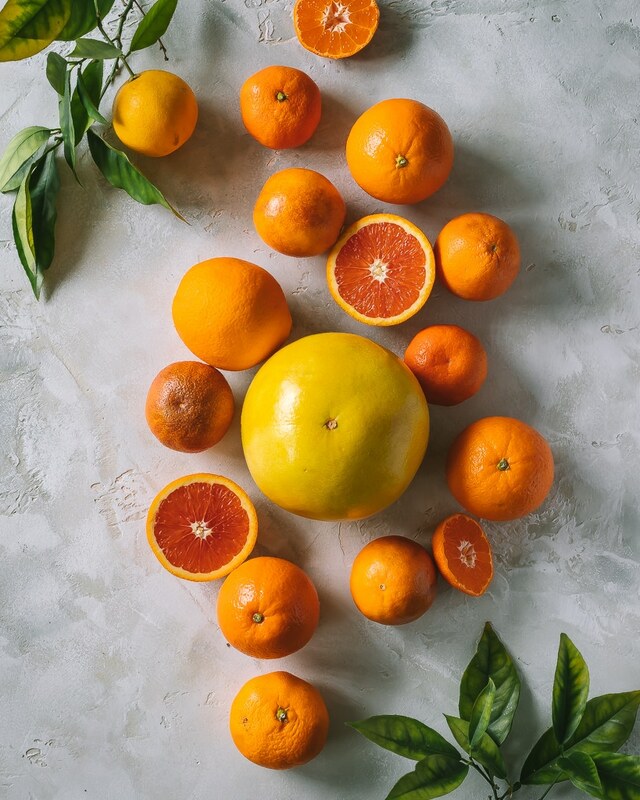 It’s all that sunny citrus, it’s so cheer inducing! This Coconut Milk Panna Cotta was inspired by a dessert I had at Gjelina in Venice recently. 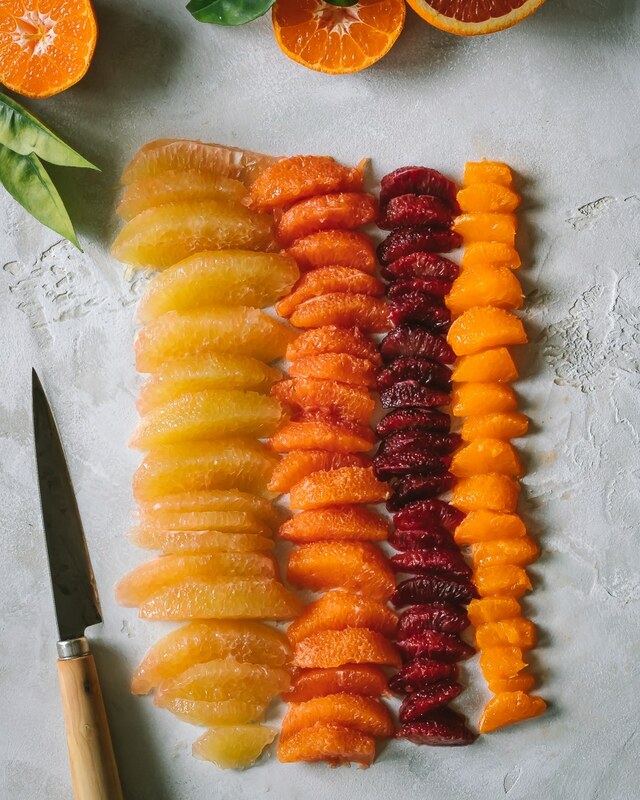 I absolutely fell in love with the winter citrus compote, so I created something similar using a mix of Cara Cara oranges, local Satsuma mandarins, blood orange and pomelo. 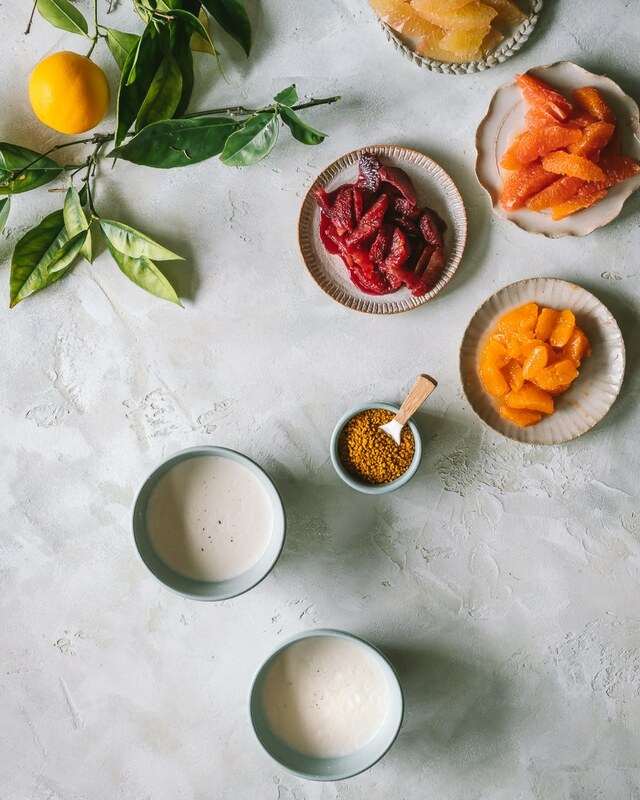 Mixing the citrus segments with honey gives them a nice syrupy consistency, and bit of bee pollen is totally optional but sets off the flavors of the honey just right. 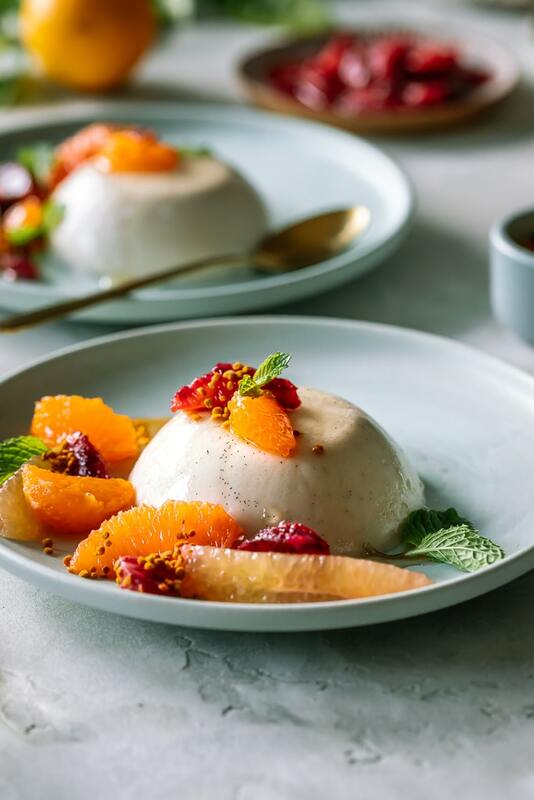 This panna cotta is so much lighter than a traditional panna cotta, which is usually made with whole milk and heavy cream, yet it is still sumptuous and luxurious. There’s no dairy, only full-fat coconut milk, and it’s also free of refined sugar, as honey is the only sweetener. I used orange blossom honey here to compliment the flavors of the citrus. Agar agar stands in for gelatin as the thickening agent, making this panna cotta vegetarian also! 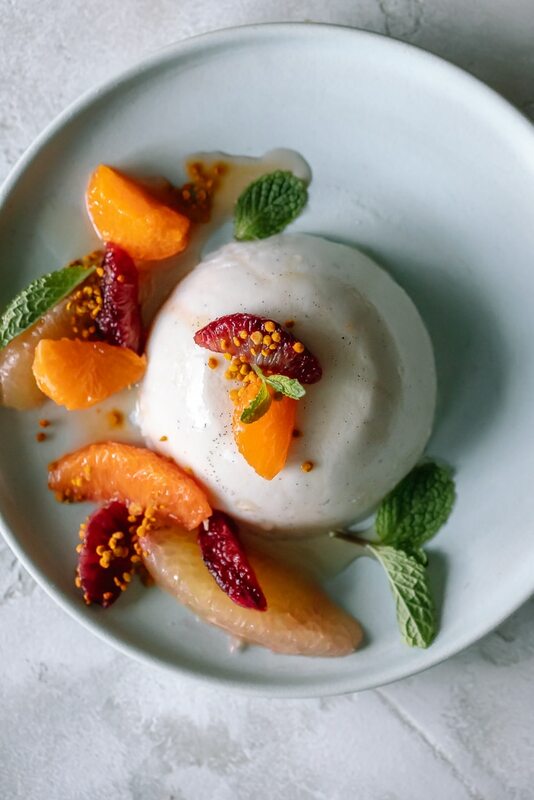 Because of the honey this Coconut Milk Panna Cotta is not technically vegan, so if omitting all animal products is important to you agave would be a great substitute. Agar agar is derived from seaweed- but don’t worry, it doesn’t taste a thing like the ocean. 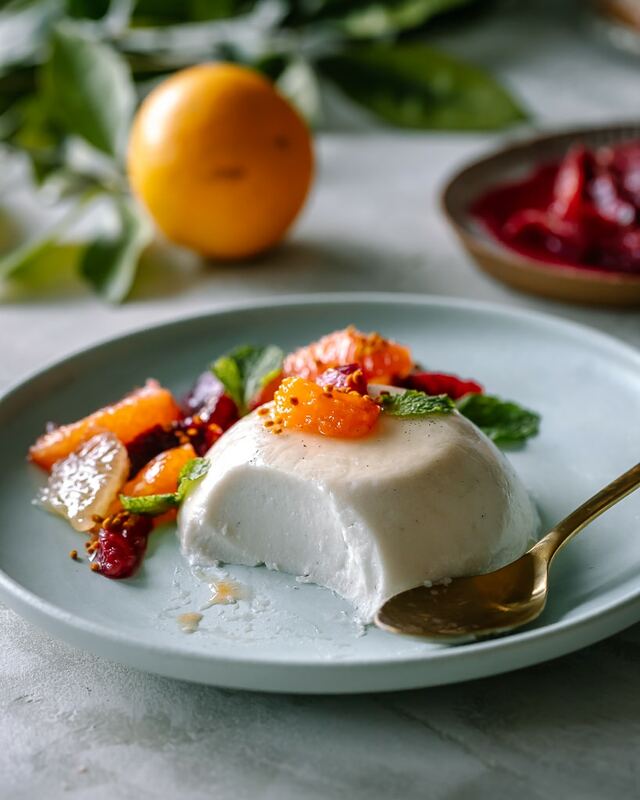 It makes a wonderful plant-based substitute to gelatin and is used as a thickening agent in foods like this Coconut Milk Panna Cotta. It is typically found in either flaked form or powder, and either works great in this recipe. 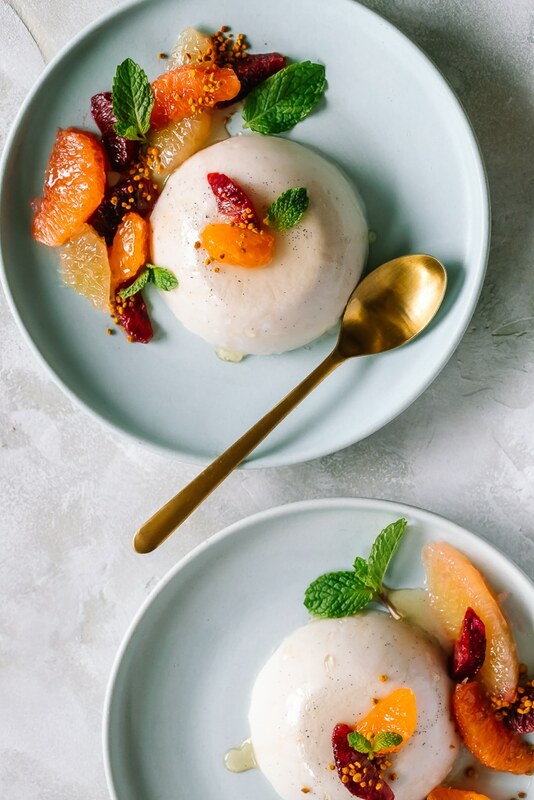 You can easily serve this dessert out of its mold by spraying the vessel you’re chilling the panna cotta in with some non-stick spray or coating it with coconut oil, then inverting it onto a plate after it’s had time to chill out in the fridge. It also helps to run a butter knife along the edge to help loosen it, then just give it a gentle shake and it should slide right out. Or you can serve it directly in the ramekin or bowl without un-molding it, in which case you don’t need to bother with greasing the bowl. Thanks for reading! To keep up with my kitchen escapades, follow me on Facebook, Instagram, Twitter, and Pinterest. If you make this Coconut Milk Panna Cotta, please share it using the hashtag #LePetitEats! 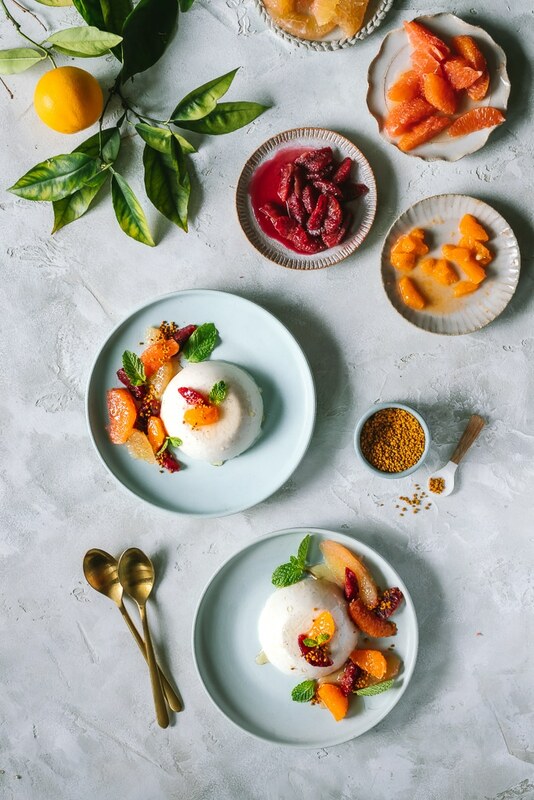 Coconut Milk Panna Cotta is a luscious dessert that’s gluten free, dairy free and refined sugar free (but definitely not flavor free). It’s especially delicious when paired with a bright citrus compote. Grease four bowls or ramekins with coconut oil or non-stick spray. Add coconut milk, vanilla bean and seeds, honey and agar agar to a medium saucepan. Bring to a simmer over low-medium heat, stirring, until the agar agar is dissolved. Remove from heat and discard vanilla bean. Ladle the mixture into four ramekins and refrigerate until firm, about 1 hour. Slice the citrus, separating the fruit from the connective membrane and removing any pith. Cut the oranges into smaller pieces if desired, and add to a bowl. Add honey and stir to combine. Once panna cotta is firm, invert each bowl or ramekin onto a plate. Spoon honey citrus compote evenly on top of panna cotta. Top with bee pollen and a few mint leaves. That’s so beautiful! I love panna cotta – never made it with coconut milk before though. Definitely want to try this. 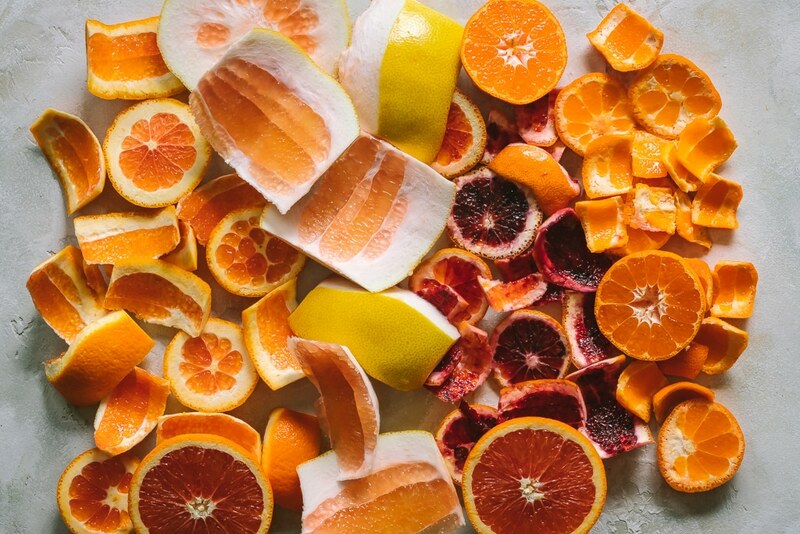 Those oranges are so cheerful! What an incredibly beautiful dish! 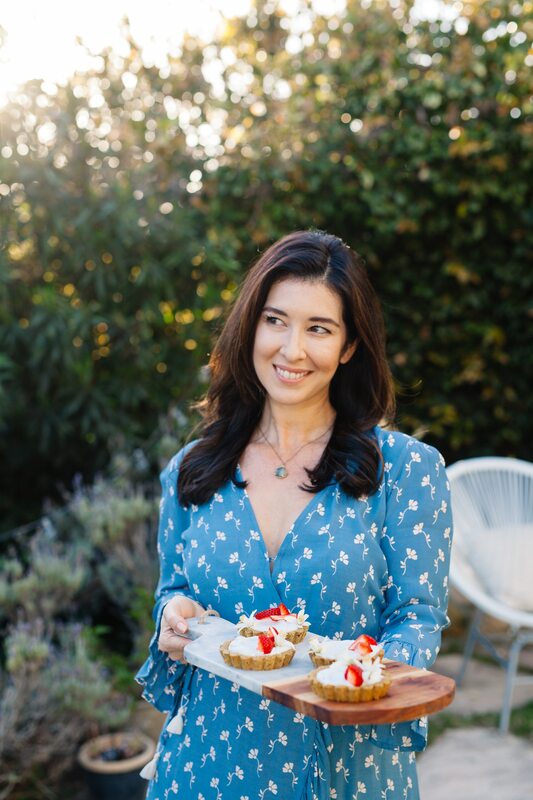 This is such a pretty dessert, and I love the idea of using coconut milk! I can’t wait to try this out! I can almost taste it from here..it looks soo delicious and healthy. Love coconut milk dessert with agar2. Definitely a must to try out. Thank you for sharing this. I have been so scared to make panna cotta! I’m always afraid that I won’t get the right consistency. I think this looks gorgeous and sounds so good! This one is pretty foolproof! And really fast, the panna cotta comes together in about 5 minutes (plus chilling time). Is there a way to use gelatin in this recipe if you don’t have the agar agar? What measurement would you suggest? Like Gina I am also wondering what measurement you’d use to sub gelatin for agar agar. Also wondering how much pure vanilla extract you’d sub for half a vanilla bean? It would not make the recipe vegan to use gelatin so I have not tried it with this particular recipe, but I would suggest starting with 1 packet and seeing how that works out. And you would also have to follow the method for a traditional panna cotta recipe that uses gelatin since it differs slightly from agar agar. I’m sure there is a coconut panna cotta recipe online that uses gelatin, so your best bet is to try searching for one and see what the measurements/instructions would be for that. For vanilla maybe 1/2-1 teaspoon? Hope that helps!